To paraphrase the old saw about the weather, everybody talks about the National Aboriginal and Torres Strait Islander Art Awards, but nobody does anything about it. OK, that’s harsh. MAGNT has been under disturbing pressure for years now (and not just in relation to the NATSIAA). The Art Awards themselves have changed, for reasons that remain unclear, with fewer works selected for judging and display of late. Competition, first from the Xstrata Prize and lately and more significantly from the richer Western Australia Indigenous Art Award has intruded on the space once solely occupied by the NATSIAA. The latter, which at its last showing two years ago in 2011 on the same weekend that the NATSIAA opened, drew many visitors and a few representatives from art centres away from Darwin, seemed at the time to pose an existential threat to the venerable institution. And for years now, complaints that the NATSIAA has drifted away from its roots as a celebration of and for the artists and morphed into a mega-commercial celebration of the industry, a whitefella event rather than a blackfella party, have circulated in the media almost non-stop. Indeed, that charge is what led to the instigation of the other competing Aboriginal art event in Darwin’s August calendar, the Darwin Aboriginal Art Fair, where the focus shifted back to the art centres, even as the commercial side of things flourished. 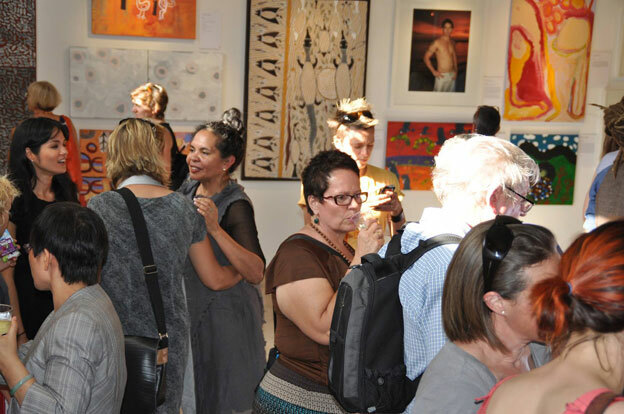 And the success of the DAAF spawned the Cairns Indigenous Art Fair, drawing away a significant participation by Queensland artists and art centres. And now there’s yet another instance of competition, if not critique. So why am I so excited about the Salon des Refusés, organized for the first time in 2013 by Paul Johnstone (of the Paul Johnstone Gallery, formerly CCAE) and Matt Ward (from Outstation Gallery)? Why should the appearance of another selling exhibition, consisting of 40 works that didn’t make the cut for the NATSIAA this year, make my heart glad? In part, I have to admit, it is the identification of this show with the famous Parisian exhibitions whose inspiration Johnstone and Ward have drawn upon, the counter-Salons that brought the Impressionists to the fore in the latter half of the nineteenth century. 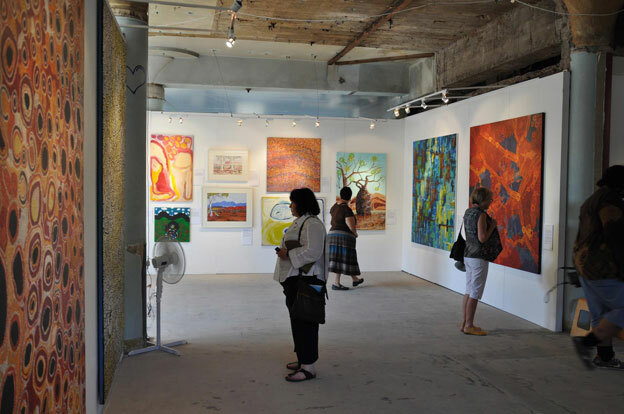 In part it is my enthusiasm and respect for the work of Johnstone and Ward themselves, who, especially since Dallas Gold decamped and moved Raft Artspace to Alice Springs, have been the most exciting gallerists in Darwin keeping the flame of Aboriginal art alive in the northern capital. And in part because I believe that their selection of works for this debut exhibition has restored a vigor to the annual celebrations that has been lacking in recent years. In 2011 I summed up my dissatisfaction with the Art Award that year by noting that the NATSIAA, for me, had been the opportunity to connect with a broad range of work, to discover new artists and new styles, to learn what was happening beyond the margins of the mainstream galleries. And the works chosen for the NATSIAA that year, and in other recent years, seemed more intent on accumulating the (admittedly) best selection of the flavor of the month than on peering into the corners of art production and exposing the hidden, offbeat delights that brought vitality to the panorama of Indigenous art making. 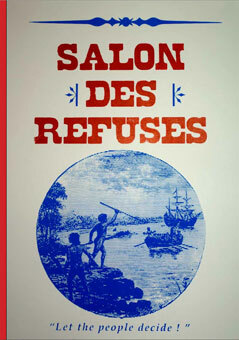 I’m not sure that the 2013 Salon des Refusés takes us all the way back to that spirit of innovation and exploration. But it does represent, in its selection, an important step in the right direction, while maintaining an entirely appropriate focus on spectacular works of art. Several of those outstanding, if well-known, examples of the best in Aboriginal painting (and the selection is heavily weighted towards painting on canvas) are entries by recent past winners at the NATSIAA. There is another brilliant Kulama canvas by Timothy Cook, along with a companion piece by fellow Jilamara artist Conrad Tipungwuti (not a prize-winner, but consistently mentioned in the same breath as Cook). There is another stunning painting by Raelene Kerinauia, as beautiful as the prize-winning bark from two years ago, but executed on canvas this time. The best work in the Salon this year is an extraordinary set of mokuy sculptures by Nawurapu Wunungmurra, carved from ironwood and unpainted: a tangle of bodies that cluster like a tangle of mangrove roots and rise like steam into a tropical dawn. In addition, there are a few works from dependable old masters, in particular a pair of paintings from Papunya Tula by Warlimpirringa Tjapaltjarri and Yukulti Napangati. Neither breaks new ground, but both are superb examples of the artists’ oeuvres, the kinds of work that reminds us of the power that the marriage of tradition and innovation brings to this art. Or maybe it’s just nostalgia that gladdens my heart to see these paintings included. I’m willing to admit that my responses to the NATSIAA are complicated and sometimes contradictory. These stunners from Papunya Tula make me think back to a point midway in the history of the Art Award, before the early twenty-first century boom in the market and in the number of art centers, when you could reliably expect a handful of masterpieces from the old well established communities, from Kintore and Balgo, Maningrida and Yirrkala, to grace the installation every year at MAGNT. But most of all, what kindles my excitement about the Salon are the surprises, the kinds of work that I’ve almost given up hope of encountering at the Museum. There’s a beautiful, subtly colored canvas, Kuluwa (winter rain), by Eva Nargoodah from Mangkaja Arts that, in its weave of patterning and its gentle variations in hue, looks instantly familiar and simultaneously brand new. Doris Bush Nungurrayi’s Tjurrpinyi (Swimming at Haasts Bluff), full of interlocking design elements and executed in rich reds and purples and muted oranges and yellows on the darkest of grounds, may be the most sophisticated single work from Papunya Tjupi that I’ve seen to date. The new art centres of the APY and Ngaanyatjara Lands are well represented here as well by Sylvia Ken, Sandy Brunby, and Ngupulya Margaret Pumani, along with one of the best works by Tjala Arts’ Ruby Williamson to date. But I’m thrilled to find three lovely canvases from Lajamanu’s Warnayaka Art Gallery: the large work by Rosie Tasman is lively and elastic in feel, as is Molly Napurrurla Tasma’s Seed Dreaming. Lily Hargraves’ Wardilyka Jukurrpa (Turkey Dreaming) is another classic Warlpiri painting: it reminds me of nothing so much as the school doors from Yuendumu, and is a reminder of the endurance of Lajamanu through decades of disruption. And then there are the masterpieces from the Spinifex People. I honestly can’t remember the last time I saw collaborative works showcased in the NATSIAA, and I’m clearly going to have to do a little research through my archives to see if such work has really been systematically excluded from consideration. Certainly the Spinifex painters have not be regulars in the Award shows, and their inclusion here in the Salon compensates for that grievous oversight. There are three magnificent, enormous canvases. The first, by Lawrence Pennington and Ian Rictor, features dark masses converging on one another with the implacability of lava flows; the second men’s collaborative, from Simon Hogan, Fred Grant, and Harry Brown, is undulating and full of light. The women’s painting pales a bit in comparison, and the other collaborative in the show, by women from Warakurna and Tjarlili is not quite as strong , but the presence of community-driven paintings in the exhibition is still a matter for serious consideration and no small rejoicing. Lisa Uhl had a near sellout solo show last year at Seva Frangos, and the work included here shows off her extraordinary color sense to great advantage. A pair of canvases by John Murray and Ninney Murray are my first exposure to painting from the Girringun Aboriginal Art Centre in Cardwell, known for its quirky ceramic spirits. Another discovery for me is Naomi Kim Grant, a Wiradjuri woman transplanted to Perth thirty years ago. Her acrylic and collage Boabs is exactly the kind of surprise I always hope for from the NATSIAA, but have received so rarely of late. There are no bark paintings in the Salon, but all the other categories are at least minimally represented: another of Gary Lee’s photographic portraits, a hollow log sculpture by Peter Gambung from Ramangining, and a video work by the young filmmaker Ishmael Marika from Yirrkala round out the genres. Marika’s work, based on a recording of a speech made by Milirrpum Marika, his grandfather, in the wake of the negative decision in the Gove Land Rights case, has particular resonance in this fiftieth anniversary year celebration of the creation of the Yirrkala Bark Petition. I’m surprised by the lack of bark paintings, and I’ll confess I’m disappointed that almost all of the works selected for the Salon come from community art centres. I understand from the rumor mill that the total number of submissions to the NATSIAA was down this year; perhaps that accounts for the demographics of this show. We’ll know better when the shortlist of accepted works is revealed. (I’m writing this review from an advance copy of the catalog of the Salon.) But there has been strong work in galleries this year from Adam Hill and Tony Albert, both previous contenders in the NATSIAA, so I hope the total picture when it emerges will be more diverse and not indicative of a sense that the Award has failed to attract a broad range of artists. Most of all, I hope that the Salon brings some of the old excitement, the buzz, back to Darwin in positive ways. The conversations about the NATSIAA of late have often been more about what it lacks than what it has to offer, and that’s a sorry state of affairs. Perhaps this maverick effort will help to bring back the sense of possibility, the cause for celebration, that should pervade Darwin in early August. My hat’s off to Matt and Paul for the tremendous work they have undertaken in that cause. Coda: I hear from Darwin that the Salon’s opening was well attended–over 300 people showed up–and that business has been brisk. I’ve snagged a couple of photos to share with you, but if you want to see many more, get on Facebook. All you need do is “like” Outstation Gallery. And what’s not to like? I’ll save my reflections on a surprising 30th anniversary NATSIAA for next week! This entry was posted in Art and tagged Exhibitions, Salon des Refusés. Bookmark the permalink. Yes the Salon Des Refuses is a great show, showing some great works that would otherwise have been forgotten for now. And the posters for the show were made by Franck Gohier, the artist printmaker behind Red Hand Prints. And important local figure, in the art scene. All the posters were hand made, printed one by one, I saw him doing them, that was great to see him at work, and to witness the care and attention that he put into them. Thanks for the inside insights on the Salon. Always good to hear from you, and hope you’re prospering up there in Darwin.